There are fewer things in life that excite me like a company that tries to spread awareness about Autism. When you have a child who lives with sensory issues every day it makes you want to tell everyone you know about these special, amazing, bright kids. I know from experience the pain of having to sit and listen to teachers tell me how different my child is. How he just does not fit in with the group. I have watched as he chose to play alone because it was easier than trying to figure out appropriate social interaction. I have also been there to watch him have a complete meltdown because of a sensory overload. It is pretty hard to watch your little boy go through something that he does not know how to control. That is why when I was given the opportunity to review a book from Sensory Star Publishing, I jumped at the opportunity. Jessie and the Super Sensorific Seashore is such a wonderful example of what a child who is on the spectrum deals with when exposed to new and different sensations. It is a heartwarming story about Jessie's first time visiting the seashore. All the new and different experiences can be scary at first and a little overwhelming. But when given time to soak it all in, it can be an exciting fun filled day. This book illustrates how a child with autism may react to certain new experiences and how a supportive family can help them through these challenges. I mean isn't that what family is for anyways? To help support one another and give us the love and care we need when we are struggling. I just love this book. I love that it says 'autism is not who he is...' As mom, I am quick to tell others that my son has Asperger's. I feel like anyone who cares for him should know and be prepared for whatever may come. But I have to be careful not to let his Autism define him. It's not who he is, it's just something that he deals with on a daily basis. It's not a bad thing either. It just means that he has to work a little harder at some things. Just like in this book, my son has a lot of sensory issues. And teaching him that his senses can be his friend is hard sometimes. Because for a child on the spectrum smells and sights and noises can be very overwhelming. Going to any new place may be a little uncomfortable for you and I, but for kids like Jessie it can be too much at first. Some great tips for preparing a child for these new experiences is a picture chart and preparing by talking about your plans. I have learned not to surprise my son with trips even short ones can be too much for him. 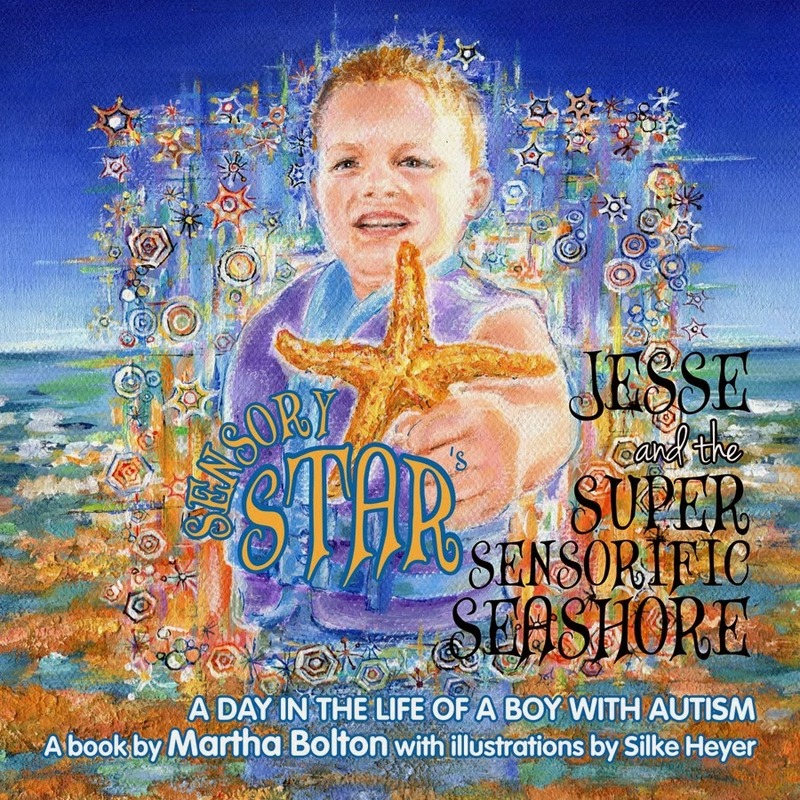 Jessie's mom makes a picture chart in the book and shows him exactly what will happen during his day and talks to him about all the new smells and sounds he will encounter during his trip to the seashore. I am sure that this helped in his successful day at the beach. I cannot brag enough on this book. 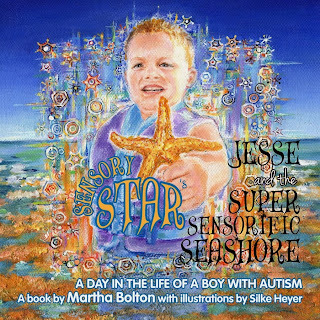 The illustration on the front of the book is taken from a real little boy, who lives with autism daily. He is on a noisy beach and probably wet, and holding a sea star and grinning. He overcame all the challenges of dealing with all the new things at the beach, and for him and his family it was a great day that will not be forgotten. This book is a must read for anyone who knows a child with Autism. It gives great insight into what a child on the spectrum may go through and how to ease some of the struggles. This book would be great for classrooms as well. I think it would be a great way to explain to other kids how their friends on the spectrum feel at times. A lucky Nurse Mommy Reader will win a copy of this wonderful book! Please use the entry form below. Disclosure: The above item was received in order to facilitate review. I have not been compensated for this post. The Nurse Mommy blog will always provide honest opinions, beliefs or experiences on products reviewed. We will only recommend products or services that we feel are of benefit to our readers. The Nurse Mommy is not responsible for prize fulfillment; sponsor will be responsible for prize fulfillment. This event is in no way associated with, sponsored, administered, or endorsed by Facebook, Twitter, Google, Pinterest or any other social media network. If you have any questions, please contact me at jhughes0507@gmail.com The disclosure is done in accordance with the Federal Trade Commission 10 CFR, Part 255 Guides Concerning the use of Endorsements and Testimonials in Advertising. I really like the foam scooter too.